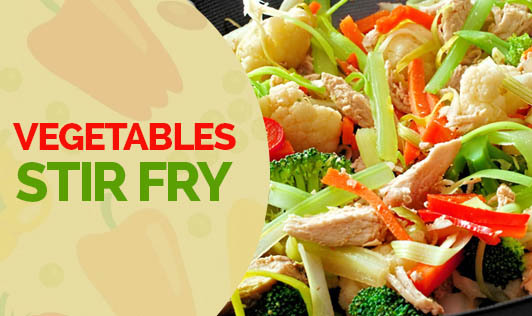 Vegetable stir fry is an easy to make recipe. It is rich in nutrients such as vitamins and minerals. This can be a wonderful dish with brown rice, white rice or chapatti. It's a good recipe for weight watchers too. • Broccoli, carrots, zucchini and bell peppers, cut into pieces - 1 cup. • Black bean sauce or dark soy sauce - 2 tsps. • Sugar (brown sugar may be a healthier preference) - 1 tsp. 1. Heat oil in a medium flame, add ginger, garlic and chilies and stir over medium heat for two minutes. 2. Add the mixed veggies and fry. You may also microwave the vegetables for 2 minutes and then stir fry. 3. Add soy sauce and sugar. Continue stirring for a minute until the ingredients are mixed well. 4. Serve it with chapatti/rice. You may add vegetables of your choice. Sprouts/peas/boiled egg can be added as ingredients to make it protein rich. You may also try grilled fish or boiled chicken to make it a whole meal. This can be a good dinner recipe, as it's easy to cook.